Measure the width and outside diameter of the wheel to be dressed. Then follow the example shown in the nomograph. Using the monograph, match the measurements with the right single dresser for your grinding wheel. Diamond is the hardness material occurring in nature. As there are no hard and fast rules for selecting diamonds, the experience that FIUDI has gained in over 50 years of work can be invaluable in helping you pick the right diamond for the job. To ensure that the correct wheel dresser is used, the operating parameters that must be borne in mind include grinding wheel size, dressing speed and dresser feed rate. 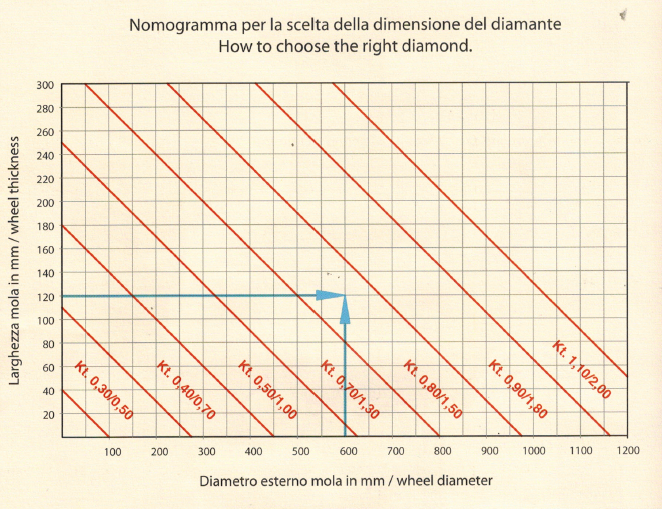 Use the nomograph shown on the facing page to select the correct diamond for the grinding wheel to be dressed. It’s not true that selecting a high grade diamond will increase grinding costs: when investing in tools, it’s better to choose quality over carat size. We recommend dressing by 0.01 to 0.03 mm on the radius. Initial dresser approach to the grinding wheel must take place gradually to prevent shock as the diamond contacts the wheel. As wheel dressers are used in an endless variety of applications, contact out engineering office for guidance. It is essential to provide an abundant flow of coolant over the entire grinding wheel face to protect the diamond from thermal shock. This is nothing to worry about. As all diamonds have the same hardness, if rapid wear occurs, it is because in the diamond is being used in phase with its least resistant crystallization plane. Simply rotate the dresser by a few degrees in either direction, and everything will return to normal. This wheel dresser is constructed with high quality diamonds in a predetermined position. Multipoint dresser are used when single dresser does not warrantly complete dressing cycle. Layered diamond tools are particulary suitable for grinding crankshafts and large cylinders, centerless grinding etc. Sturdiness, rational use of all diamonds, consistent cutting capacity, fast dressing, shock resistance, high efficiency. Coolant flow must be abundant and oriented on dressing area in order to guarantee that detached abrasive particles do not clog wheel and to better control working temperature.